The biotechnology industry keeps advancing, with researchers almost constantly discovering methods to treat debilitating conditions. HQL is one of the better funds available to play it. The fund boasts a very appealing 8.95% trailing distribution yield. There is fairly heavy exposure to just a few big names here, but the fund also invests in numerous small-cap stocks. The fund trades at a very appealing 9% discount to NAV. Earlier today, I encountered an article discussing how scientists have managed to use electrostatic therapy to improve a person's memory and cognitive function. This treatment could have major applications in the treatment of conditions such as Alzheimer's and the researchers intend to develop it further. This got me thinking about ways that investors could take advantage of this and other developments and innovations in related fields. 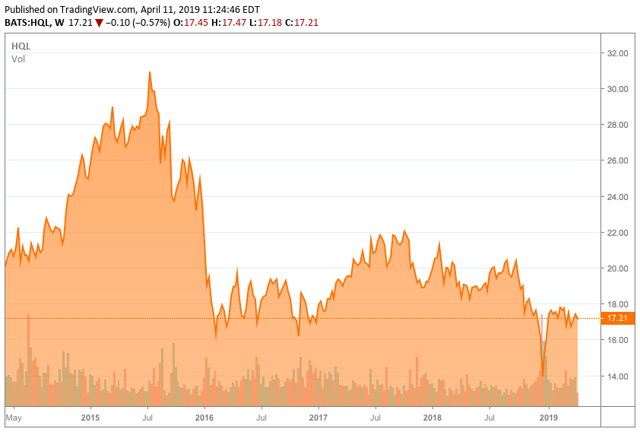 One good way in which this can be accomplished is by purchasing shares of a top-quality life sciences fund such as Tekla Life Sciences Investors (HQL). According to the fund's web page, Tekla Life Sciences Investors has the objective of generating long-term capital appreciation. This differs somewhat from most closed-end funds in that the generation of income is not a goal of the fund (although it does boast a respectable distribution yield). The reason for this may be the fact that the fund invests primarily in the life sciences industry (especially biotechnology and related fields) along with the agricultural and environmental management industries. These are not exactly industries that are well-known for paying out high dividends as most cash flows are reinvested into further research and growth projects. In addition, the web site notes that the fund's managers specifically target smaller emerging companies, which would further focus the fund's return profile towards capital gains and away from dividends. It is quite possible that the purpose of these large companies in the portfolio is to add a certain amount of stability to the portfolio. After all, it is fairly well known that large-cap stocks tend to be less volatile and less risky than small-cap ones. Meanwhile, small-cap stocks historically have larger returns than large-cap ones due to the risk/reward trade off that is one of the fundamental rules of finance. Thus, the fund's approach appears to be roughly balancing itself between both large-cap and small-cap stocks in order to produce high returns with a lower amount of risk for its shareholders. As my regular readers on the top of closed-end funds are no doubt aware, I generally dislike seeing any individual holding in a fund account for more than 5% of the fund's total assets. This is because this is approximately the level at which an asset begins to expose the fund to idiosyncratic risk. Idiosyncratic, or company-specific, risk is the risk that any individual asset has that is independent of the market as a whole. The concern here is that if some event happens that causes the price of a heavily-weighted asset to decline, then it could have a very noticeable effect on the portfolio's value. If the asset had a somewhat lower weighting, then this risk would be diversified away and we would not have to worry about it. As we can see, there are six companies that have a weighting greater than 5% of the portfolio, creating some risk to investors with respect to these individual stocks. Perhaps curiously, we see very little exposure here to either agriculture or environmental management, which are two industries that the fund has previously stated that it invests in. However, it is the exposure to biotechnology that attracted me to this fund in the first place so this is not really something that I am worried about. With that said though, the biotechnology industry is certainly not without risk. In the past, investors in the market have been known to assign very high multiples to these companies sometimes before they even had any revenues. 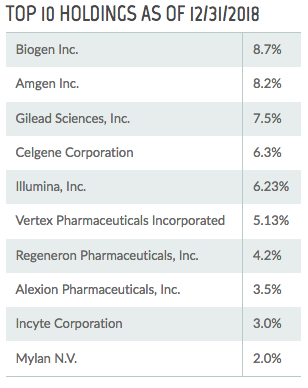 As might be expected, the returns from buying into these firms have left something to be desired. Fortunately, the fund seems to be avoiding this problem both through the diversification that it offers and smart investment management. Tekla Capital Management is fairly well-known for solid performance from the healthcare funds that it manages, and this management team is smart enough to avoid buying into high-flying overvalued plays. Admittedly, the fund's near-term performance has been nowhere near as good as it has delivered negative returns over most of the past year. 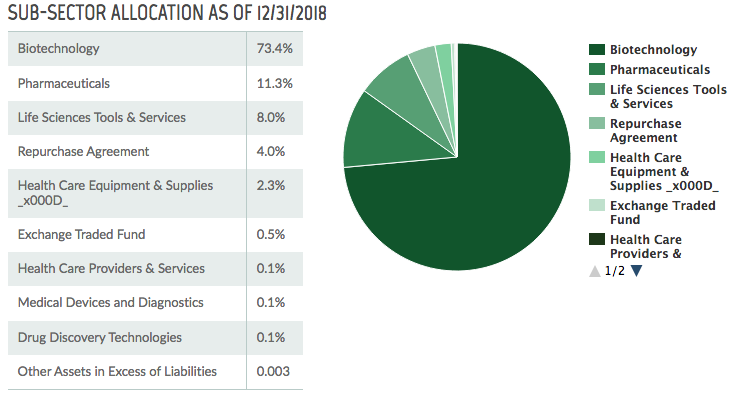 However, 93% of all assets delivered losses in 2018 so we need to keep this in perspective. This poor performance in 2018 also would have dragged down the annualized returns over the other periods shown above. Considering this, we can see that the fund has delivered strong performance over the years. As is the case with most closed-end funds focused on capital gains, HQL pays out its capital gains to its shareholders in the form of distributions. The primary reason for doing this is to keep the fund's share price at a reasonable level for the retail investors that ordinarily buy these funds. Of course, government regulations also play a role as closed-end funds are required to pay out their realized capital gains and any received dividends to their holders on an annual basis, although they do not actually have to pay out unrealized capital gains. For its part, HQL follows a managed distribution policy and simply pays out 2% of its net asset value every quarter. The managers of the fund believe that this is roughly the amount that it can reliably generate in capital gains. This gives the fund a trailing twelve-month distribution yield of 8.95%. It is also important to note that these distributions are typically paid in-kind as opposed to being in cash. An investor that wants cash can certainly take it in that form though. This reinforces the earlier conclusion that the fund's managers are attempting to maintain the share price of the fund at a level that allows retail investors to easily buy in. However, this combined with the fluctuating distribution means that this is not an ideal fund for somebody that needs a steady level of income and is better suited for someone looking to grow their wealth. A good argument can certainly be made for the future of healthcare and related industries such as biotechnology. Perhaps the biggest of these deals with demographics. According to the US Census Bureau, there are approximately 72 to 74 million people in the United States aged 54 to 73 years old. This group is known as the Baby Boomer generation and they were born into the relatively prosperous period following the end of the Second World War. This age group represents approximately 20% of the nation's population and is more numerous than any generation that came before it. As a result of these numbers, we can easily conclude that the number of people older than eighty years will increase rapidly over the next thirty years. This is historically the age at which an individual's health starts to deteriorate and their consumption of healthcare products and services jumps upward as does the money that they are responsible for injecting into healthcare companies. Thus, the healthcare industry itself is likely to grow as the population of people in their twilight years does. This is also likely to produce growth for biotechnology and other companies working to develop treatments for some of the conditions that often accompany aging. As is always the case, it is critical for us to ensure that we do not overpay for any asset in our portfolios. This is because overpaying for any asset is a surefire way to ensure that we generate sub-optimal returns from that asset. In the case of a closed-end fund like HQL, the usual way to value it is by looking at the fund's net asset value. Net asset value is the total market price of all of the assets in the fund's portfolio minus any outstanding debt. It is therefore the amount that a shareholder could expect to receive if the fund were immediately liquidated. Ideally, we want to purchase shares of a fund when they are selling at a price below net asset value as this essentially means that we are acquiring the assets of the fund for less than they are actually worth. 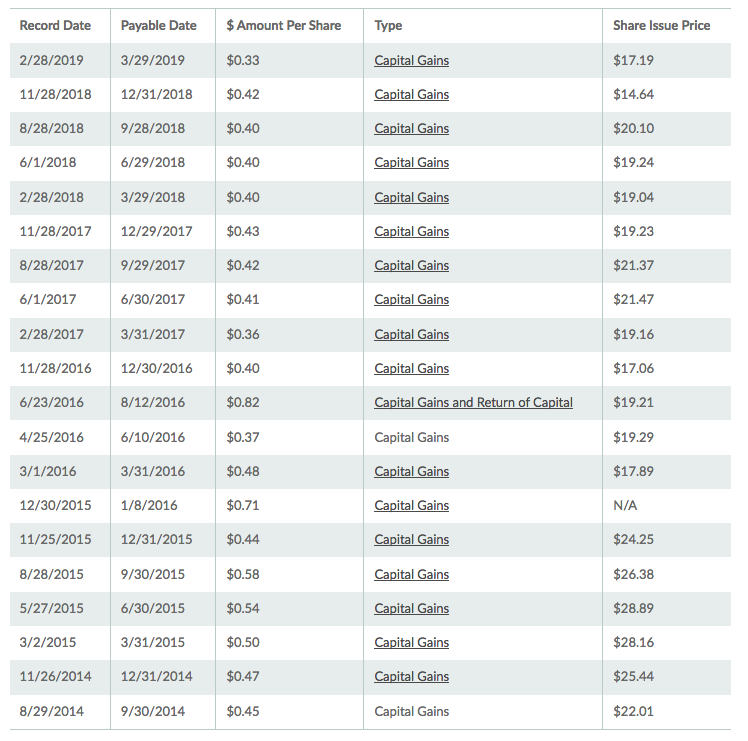 As of April 10, 2019 (the latest date for which data was available as of the time of writing), HQL had a net asset value of $19.02 per share. 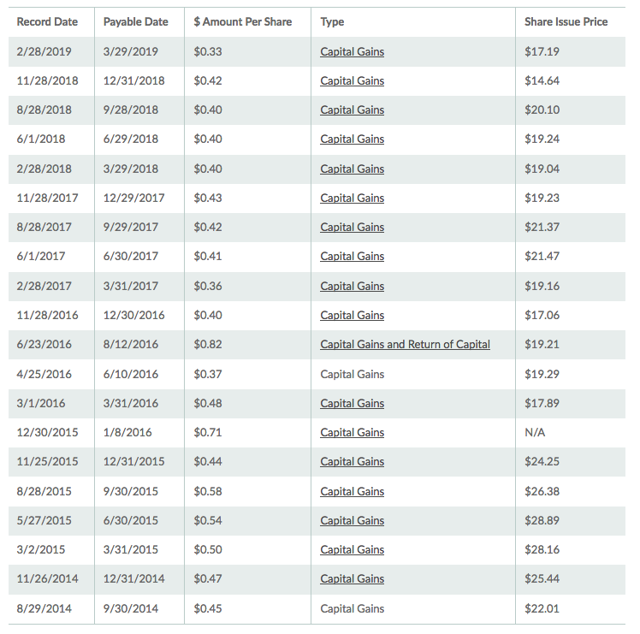 As the fund currently trades hands for $17.31 per share, it is selling at a discount of 8.99%. This is a fairly appealing discount that represents a fairly good entry price. In conclusion, Tekla Life Sciences Investors is a high-yielding closed-end fund that allows investors to play one of the most innovative sectors of the healthcare industry. This industry as a whole has a fairly promising future as the population continues to age and increases their consumption of health-related items. The fund is currently trading at an attractive discount to net asset value, which represents an appealing entry price. Overall, it is worth considering for your portfolio.